Sometimes improving our horsemanship – a pursuit dominated by the almighty and intangible “feel” – can be like trying to capture dandelion seeds in the wind or bottle fog. How do we effectively translate what we read or watch cerebrally into our daily interactions with horses? 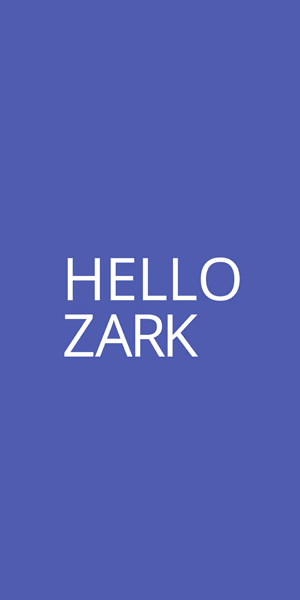 At HorseHead, we believe that the more we know about brain functioning in horses (and fellow humans, for that matter), the better our chances of translating language and ideas into actual, beneficial work. In other words, learn more to ride better! This article, on the brain region called the Reticular Activating System (RAS), goes to the root of that belief. Watch this helpful video on the RAS. Before you consider any particular exercise, for instance, it’s essential to have your horse’s attention. That seems like a no brainer. What does attention look like? What does inattention look like? 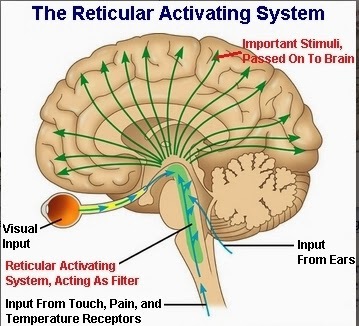 The RAS (also known as the Reticular Activating Center, RAC, see image below right) located at the base of the brain, on top of the spinal column, is responsible for filtering incoming perceptions of sight, hearing, touch, and taste. Think of it as a gatekeeper, a triage nurse, a nightclub bouncer sorting out VIP’s. Without it, the brain would be overwhelmed with stimuli. At any given moment, the horse’s RAS establishes an attention hierarchy. Being a prey animal, this prioritization necessarily weighs heavily toward self-preservation. If the dogs come racing at your horse, for instance, they will necessarily dominate its attention. Let it look at a scary banner from different angles. In order for the horse to form fruitful neural connections, ie, to learn effectively, we have to be Numero Uno on the RAS attention hierarchy. It’s essential that we – our cues from our legs, seat, hands, voice – stay on top. Is your horse grazing? Looking elsewhere? Ignoring your requests? If so, consider yourself bumped down the attention pyramid. When a horse moves through a task without giving its full attention, the synapses involved in completing the task are weaker than synapses formed with full attention. They will degrade over time. Similarly, horses forced to drill over and over may not be learning and developing dendrites (branch-like extensions of nerve cells) as well as the horse that’s truly engaged. “A horse that is forced to go from A to B over and over is not as prepared as the horse that’s been allowed to search out things and can go from A to B to M to Z. That horse has a lot of dendritic options,” said Dr. Steve Peters. It often takes a lifetime of experience, observation, and “feel” to appreciate these distinctions. You might think you have an engaged learner under saddle, but your horse might have checked out at some stage along the way. Good trainers allow horses to search and find relaxation in the midst of pressure (say, in response to flag use or leg cues). If the horse decides to ignore these pressures, you’ve also been bumped down the RAS attention pyramid. Brain growth is determined by how well we have a horse’s attention, but we must take care that we aren’t forcing it, creating anxiety, or on the contrary, not providing enough stimulation. “All these factors will result in the horse being unable to attend and optimally learn,” said Peters. You may make progress without willing attentiveness. There are plenty of horses who can learn patterns through drilling or who can cross creeks when spurred. But be careful of the scaffolding you’re building, it may come crashing down when something more urgent or stressful enters the equation. Posted in Neuroanatomy, Training and tagged horse attention, horse brain anatomy, horse learning, reticular activating center, reticular activating system. Great article. Lots of food for thought. My RAS let it all in (I hope!). Thanks for your work helping people come to better understanding of their horses and themselves! Well written. Thank you for such a clear understanding on the equine learning process. Curious about how/if the RAS is different in humans and horses? Different species and brains so wondering if the RAS works differently. Hi Leslie, the RAS is the same in the horse and the human. However, it’s important to remember that the sensory information coming into this ‘gatekeeper’ is different. For instance, horses and humans have very different eyes. Also, the overall brains ARE different. The human brain, for instance, may reason and rationalize the information. The horse, meanwhile, lacks a developed frontal lobe and is a prey animal – two elements that make actions and potential actions profoundly different. Love it! A new window to define “harmony”. I love the insight I get from your horse brain related articles. Its good information for both me and my horse. By having some idea of what my horse is experiencing, I am more confident knowing what is going on and I know my horse appreciates it and is better off. Thanks! Great explanation for understanding the attention and learning process of the horse via brain function. Thanks for another easily understandable teaching of a complex subject for most horse owners. So very helpful! Very useful and clear article, thank you.